+ Change the colour of your eyes ! You wish to change the colour of your eyes ? 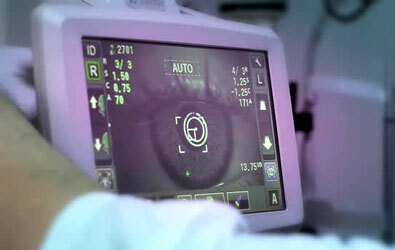 The coloured iris implant is an operation to insert, inside the eye, over the iris, a coloured implant. This implant consists of an annular artificial iris which is coloured, biocompatible and flexible. + What are the indications ? The coloured iris implant is proposed to patients who wish to change their eye colour for aesthetic or medical reasons. + How are the implants made ? The implants are made from ophthalmological quality silicon which has been used safely for several decades in ophthalmology. They are guaranteed for life and are well tolerated by the human eye. The patient can keep it for as long as he wishes. A medical checkup is recommended every 6 months. If you have any questions please do not hesitate to contact us. 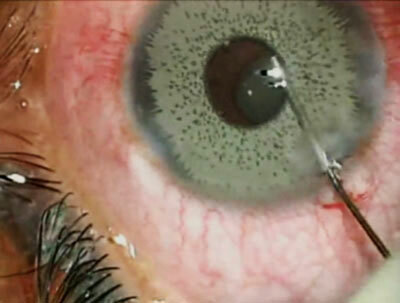 And to verify whether there are any contra-indications for this operation: a complete medical history of the state and health of his eyes, an examination of his general eye sight ( including visual acuity and refraction with and without glasses, intra-ocular pressure and gonioscopy of the interior angle……..). For further details on this examination, please do not hesitate to contact us. According to the recommendations of the anaesthesist it is indispensible to be fasting on the day of the operation. On average the duration of the operation is 15 minutes per eye. The outpatient treatment usually lasts half a day. Both eyes are treated at the same time. Sight will be cloudy and blurry and a halo will form which will disappear progressively after 3 or 5 days. The eyes will suffer from glare but this feeling is often moderate, tolerated and regressive. .
Redness or irritation may occur after the operation which will disappear after 3 to 5 days. You are strongly advised NOT to rub the operated eye during the first few weeks after the operation, in conformity with the surgeon’s instructions. You can go back to work after one week or 10 days. Sports activities can be resumed after two weeks. Rigorous monitoring and a clinical examination by an ophthalmologist is essential every 6 months for as long as the implant is inside the eye to make sure that the implant is being well tolerated in the very long run. 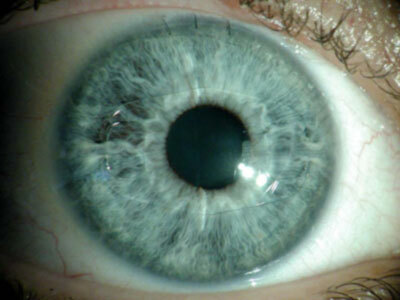 The coloured iris implant is also subject to the same general rule whereby there is no surgery without risk. Even if the risk is very low, benign complications are still possible. If the patient does not tolerate the implant then it can be withdrawn without any sequelae. You can send us your questions by contacting us.